Keeping future generations in mind. Adelaide Airport is the major gateway to South Australia with approximately 7 million passengers and a further 14 million meet and greet visitors per year. Adelaide Airport is committed to minimising its environmental footprint and achieving 100% regulatory compliance whilst being an industry leader in environmental sustainability. Adelaide Airport has an internationally recognised carbon program. In 2013, it became the first airport in Australiasia to receive Level 1 Airport Carbon Accreditation under the independently assessed global program run by Airports Council International (ACI). Accreditation to Level 2 was obtained in 2014, in recognition of Adelaide Airport’s success in reducing carbon emissions. We are not only concerned with those activities under our direct control but of all airport users and seek to influence change through collaboration and negotiation with key stakeholders and awareness and education. Our philosophy, underpinned in the company-wide Sustainability Policy, is to operate and develop our airports in accordance with the principles of sustainable development, recognising that the success of our organisation can be enhanced by conducting business in a way that is environmentally, socially and economically responsible. We believe that in choosing this path we can improve outcomes for our business, our stakeholders and the wider community for generations to come. Adelaide Airport acknowledges that the world is heading towards a carbon constrained future which demands that businesses address the various risks associated with climate change and energy. Adelaide Airport’s commitment to managing and minimising carbon emissions generated by operation activities and reducing energy consumption is underpinned by its Low Carbon Statement and Carbon Management Plan. A mature greenhouse gas accounting system forms the foundation of AAL’s carbon management program and is essential in measuring progress against reduction targets. The system was verified by Airports Council International (ACI) in 2013 resulting in Adelaide Airport being the first in Australasia to be awarded certification to Level 1 of the ACI Airport Carbon Accreditation program. Airport operators are currently below the corporate greenhouse reporting threshold under the National Greenhouse and Energy Report Act 2007. However, AAL is conforming to, and reporting against, ACI’s rigorous accounting standards. Electricity is mostly consumed by AAL terminal buildings, car parks, offices, street lighting and airfield lighting. AAL is achieving improved energy efficiency through initiatives such as LED lighting, sensor-operated lighting, smart heating and cooling operation and upgrades, and staff awareness campaigns to change energy habits. Furthermore, AAL operates a 114kW solar PV system on the Terminal 1 roof and 10% of purchased retail electricity is certified GreenPowerTM. AAL has also commenced upgrades to its vehicle fleet to reduce emissions with fuel efficient vehicle replacement and introduction of plug-in electric vehicles. 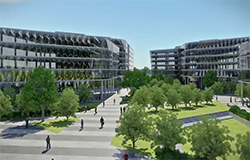 Collaboration is occurring with tenants to employ green leases for ‘green’ infrastructure, such as the new Australian Federal Police facility which is rated to 4-star Green Star and 4.5-star NABERS. In an ongoing effort to minimise energy consumption, AAL will continue to identify and implement cost-effective energy reduction projects, expand the preventative maintenance program in alignment with development; educate employees on energy efficiency practices; and identify opportunities to generate renewable energy onsite. As a significant quantity of energy consumption is under the direct control of various airport businesses, AAL will continue to guide and influence stakeholders on energy efficient practices and encourage the adoption of clean energy principles. Waste management at Adelaide Airport is driven by Zero Waste SA’s hierarchy of waste management: reduction, reuse, recycle, recovery, treatment and disposal and is underpinned by AAL’s Waste Management Strategy. Waste streams generated on-airport include organics (e.g. food), paper and cardboard (e.g. newspapers), aluminium cans, plastics, electronic, construction, hazardous (e.g. waste oil, fluorescent tubes) and green waste. Recycling rates increased significantly with the implementation in 2010 of public space recycling in Terminal 1 for general, comingled recyclable and paper/cardboard waste streams. This scheme complements the existing recycling system available to retail and airline tenants. Further, after the successful implementation of a food organics recycling trial involving two retailers within Terminal 1 the scheme has been expanded to all food and beverage tenants. Food scraps and coffee grinds are taken by a waste contractor to a composting facility where it is turned into a quality compost product that is sold back to businesses and the community. Similarly, AAL mulches and composts garden waste on airport for reuse. Mature recycling programs exist in AAL offices and many tenancies for paper and cardboard, printer cartridges, waste oil, batteries, drink containers, construction waste and food waste. Significant proportion of demolition waste from AAL construction projects is recycled into a product that can be used in road construction and maintenance. AAL works collaboratively with tenants to reduce waste and seeks to positively influence their environmental performance. AAL is responsible for the management of all vegetation and wildlife at Adelaide Airport. Vegetation at Adelaide Airport is managed through the designation of conservation zones and implementation of airport landscaping guidelines. AAL is committed to managing biodiversity at Adelaide Airport through the establishment and ongoing management and improvement of the Patawalonga Creek Conservation Zone. The conservation zone is recognised for its habitat value as one of the last remaining stands of remnant Swamp Paperbarks (Melaleuca halmaturorum) fringing Patawalonga Creek and also supports a number of other flora and fauna species of state and / or regional significance. Adelaide Airport has had a short yet vibrant history as South Australia’s domestic and international gateway for nearly 60-years. In that time, the airport has substantially expanded and the infrastructure evolved to service the rapidly expanding aviation industry. The Vickers Vimy aircraft, flown by brothers Sir Keith and Ross Smith in the famous London to Australia air race of 1919-20, is housed in a purpose-built, climate-controlled facility on airport. AAL will continue to ensure it is routinely monitored, maintained and restored in accordance with Commonwealth requirements to protect its heritage value and uphold its significance to the South Australian and broader aviation community. Ethnographic records indicate that areas of Adelaide Airport were once favoured camping places for the Kaurna people, the Aboriginal people of the Adelaide Region. The Patawalonga Creek and surrounding system of interconnected rivers and wetlands were integral to Kaurna culture. Prior to European settlement the Kaurna people had frequented the Patawalonga giving to it the name we use today meaning “boggy and bushy stretch with fish”. Reports from early settlers indicated that the local aboriginal people had camps on the creek’s eastern bank and made rush baskets, bags and mats that were sold to local European settlers. After European settlement the Patawalonga Creek was often used for recreational boating. In 1886 the seawall, lock gates, upper weirs and wharves had been constructed to form Patawalonga Lake. The lock gates were destroyed by flood water coming down the Patawalonga Creek shortly after with the current weir not constructed until 1960 following construction of Adelaide Airport in 1955. The foundation of environmental management at Adelaide Airport is compliance with all relevant regulations and minimising the impact of airport operation on the environment and local population – AAL is committed to effective management and monitoring of noise, local air quality, stormwater, soil and groundwater, and on-airport hazardous substances. Adelaide Airport is situated within a highly urbanised area surrounded by residential, recreational and industrial zones. Air quality in the western Adelaide airshed has been monitored by the South Australian Environmental Protection Authority (EPA) for more than a decade at a site in the adjacent suburb of Netley for ambient levels of key pollutants; namely carbon monoxide (CO), nitrogen dioxide (NO2), ozone (O3), sulphur dioxide (SO2) and particles less than 10 micrometres in diameter (PM10). Data published to-date by the SA EPA shows air quality in the airshed that encompasses Adelaide Airport meets the relevant Environment Protection Act 1993 and National Environment Protection (Ambient Air Quality) Measure 2003 criteria. Air quality modelling and monitoring. Adelaide Airport is bounded to the north by the Cowandilla-Mile End Drain, to the west by the Airport Drain and to the east and south by Keswick-Brownhill Creek. The Cowandilla-Mile End and Keswick-Brownhill catchments are highly urbanised and all drain into the Patawalonga Lake before entering Gulf St Vincent. An internal drainage network is present and directs the majority of stormwater into the Airport Drain, which similarly discharges to the Patawalonga Lake. Sources of stormwater pollution at Adelaide Airport are similar to those in urban catchments, namely vehicles, roads, debris from vegetation, sediment, general commercial activities and hazardous substances storages. To mitigate these impacts, interceptors are specified for installation at the discharge point for all new developments. High risk tenants are also regularly inspected to check the suitability of hazardous substance stores and other potentially polluting activities. New aprons may pose an increased risk of impacting quality of stormwater runoff from refuelling and aircraft washing. Spill response and clean-up in accordance with the Airport Emergency Plan is intended to minimise environmental impacts from fuel incidents, and aviation operations are inspected for conformance to AAL’s Aircraft Washing Guidelines. AAL is committed to improving stormwater quality and consequently the ecological health of the airport’s waterways by supporting aquatic ecosystems, as detailed in the Stormwater Quality Management and Improvement Plan (SQMIP). Implementation of this plan – which includes monitoring and assessment of the ecological health of the open drain network, installation of gross pollutant traps, drain revegetation and adoption of water sensitive urban design principles – will reduce pollutant loads from on-airport activities. Historic and recent contamination is present at Adelaide Airport and AAL is committed to an ongoing role in managing these site and minimise risk to human health and the environment. AAL continues to manage soil and groundwater at Adelaide Airport through the Contaminated Site Management Plan and associated auditing and monitoring programs. AAL’s Building Approval process provides additional support to the management of contaminated land at Airport with the requirement for environmental site assessments to be undertake prior to development or upon a change in leasing arrangements. Hazardous substances, primarily aviation fuels and oils, are used across the airport on a daily basis and have the potential to cause significant environmental and health impacts if they are not appropriately stored and managed. Any hazardous substances stores and tanks, and associated spill response equipment, are regularly inspected for compliance with relevant standards. AAL staff and airport operators receive spill response training, and spill response equipment is kept in designated airside and landside locations. The Airport Emergency Plan includes a response framework for large spill incidents. Asbestos-containing materials are recorded, inspected and managed in accordance with State regulations and AAL’s Asbestos Management Plan. An Asbestos Register is held for all AAL-owned buildings and selected materials are removed on a risk basis. Any demolition works consider the Asbestos Register, and removal is required by qualified contractors in compliance with regulatory standards. Bird strike can cause significant damage to aircraft and poses a risk to human life. AAL, as the airport operator, is responsible for and committed to ensuring passenger safety and implements a comprehensive wildlife hazard management program in accordance with the requirements of the Civil Aviation Safety Regulations 1998. In 2007, the program was augmented by a bird risk assessment, using more than 20-years of census data, which identified birds that pose the highest risk to aviation safety at Adelaide Airport. A wildlife mapping tool was then developed in 2008 utilising Geographic Information System (GIS) technology. Both these tools underpinned Adelaide Airport being awarded ‘Capital City Airport of the Year’ in 2009. The formal establishment of the Adelaide Airport Wildlife Hazard Management Committee has further strengthened these relationships and information channels on this important area of safety management. AAL is in the process of collaborating with government, the Commonwealth Department of Defence and aviation stakeholders to identify high risk activities across metropolitan Adelaide within three Wildlife Hazard Management Zones (at 3-kilometre, 8-kilometre and 13-kilometre radius of the airport) in accordance with the National Airports Safeguarding Framework Guideline on Managing the Risk of Wildlife Strikes in the Vicinity of Airport (NASF Guideline C). Tenants posing a high risk of wildlife attraction are provided with guidance in developing Waste Management Plans, with the aim of reducing the likelihood of attracting wildlife to the airport environs. To ensure landscaping and replanting programs do not produce habitats or resources that may cause high risk bird species to increase in numbers at the airport AAL has developed Landscape Guidelines for all landscaping and replanting programs on the airport.